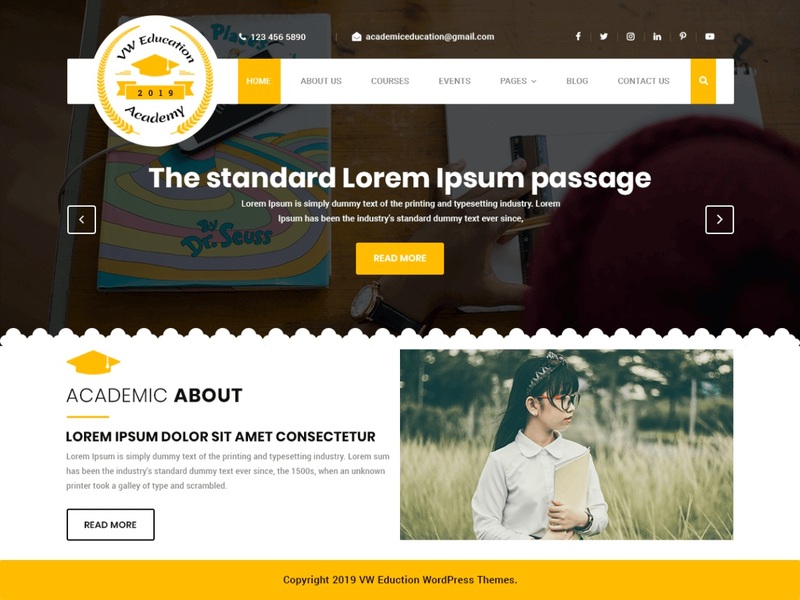 VW Education Academy is a sophisticated, youthful, robust and feature-full academic WordPress theme that will make learning and teaching a pleasant and fun experience for both teachers and students. It is an ideal theme for all types of teaching and educational websites whether it is for high-school, college, university, training academy, coaching center, LMS, guidance and counseling center, institute, distance learning, online library or discussion forum. It is highly customizable so you can change its color scheme, fonts, images and background to use it for kindergartens, playschools, day care centers, primary schools, and similar websites. It has an intuitive design and super-flexible layout that can be changed from boxed to full-width to full-screen. Since VW Education Academy is fully responsive, it makes your content accessible from any device. The use of social media icons makes content shareable on various networking platforms making your content further easy to access. The theme is all-browser compatible, multilingual, retina ready and supports RTL writing style. It is built on the recently launched WordPress version resulting in a modern and updated website that will work smoothly for years. There are many inner pages and several sections predesigned to serve the needs of an academic website.